In Santina, Osborne has crafted a complex character with greater depth than typically found in YA fare. Lessons in Greek and philosophy are the highlight of seventeen-year-old Santina Pietra’s week, but when a shared passion for alchemy and learning evolves into passion of a different sort, Santina’s tutor, the dreamy scholar Calandrino, chooses to leave San Gimignano to pursue his interest in the discovery and translation of ancient alchemical texts. Heartbroken but determined to follow her own path, Santina attempts to avoid an arranged marriage by joining the enigmatic village midwife, Trotula, in her cottage on the outskirts of the village. Santina’s story rings true for the time period and is replete with language and customs typical of 14th-century Italy. A time line of historical events accords a greater sense of what is happening in the political, literary, medical, and scientific worlds. The formal language used in Santina’s correspondences, coupled with the natural integration of religion, creates a believable time and place where a girl like Santina might come of age. In Santina, multiple-award winner Mary A. Osborne has crafted a fully complex character, impulsive and enthusiastic on the surface, but with greater depth than typically found in YA fare: Calandrino’s departure does not control her life; and her mother, lost in childbirth, plays a large role in her decision making and determination to pursue the safe practice of the Cesarean section, despite the dangers involved. The book is sprinkled with Italian vocabulary, both modern and particular to the medieval time period. Definitions are implied or provided and easy to decipher, adding to the air of authenticity. A glossary provides specifics, denoting, for example, the difference between strega (witch) and streghe (witches). 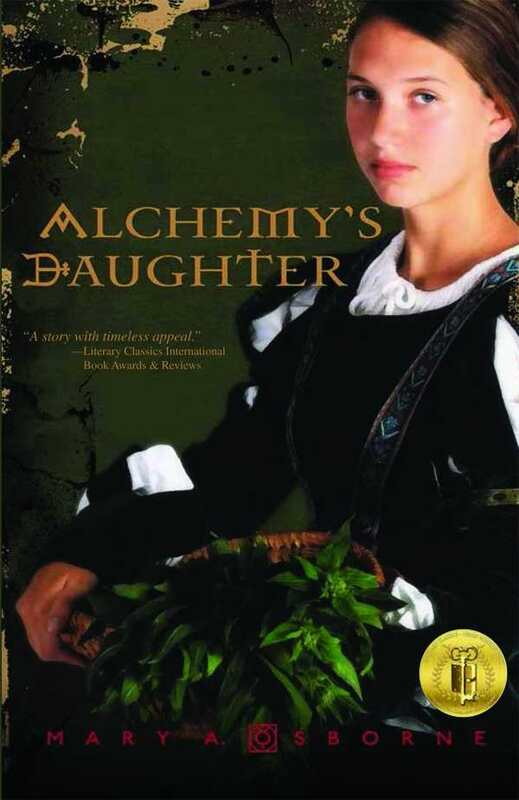 Listed as book a companion book to Nonna’s Book of Mysteries, Alchemy’s Daughter is separated from the first book by generations. Both function well independently so may be explored in either order without confusion. Osborne promises a third installment. A good choice for those who enjoyed either Cushman’s The Midwife’s Apprentice or McMahon’s The Alchemist’s Daughter. Santina’s story is a lively, emotional journey worth sharing.